Two nearly identical tablets let us dig deep into the differences. Should you buy a laptop with a tried-and-true Intel chip, or an upstart from mobile leader Qualcomm? 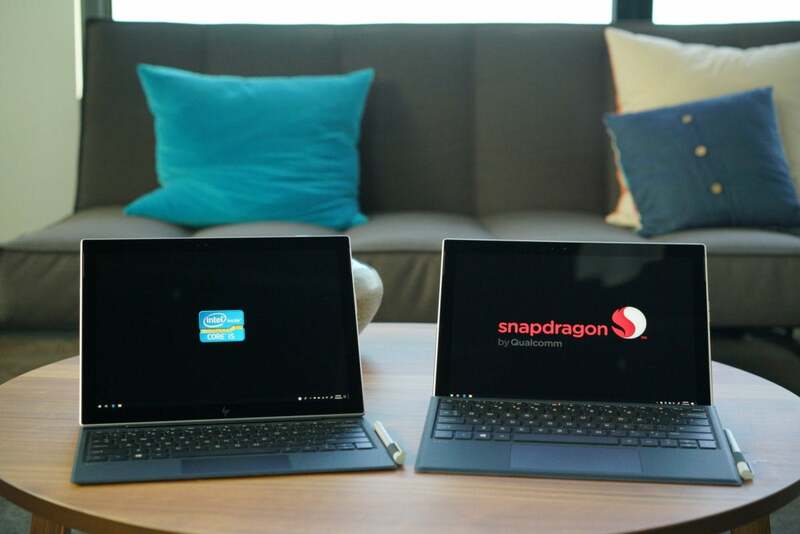 While it’s generally accepted that the Intel chips offer better performance, and the Snapdragon chips offer better battery life, we had a unique opportunity to dive deep into the differences when we tested two versions of HP’s Envy x2: one with Qualcomm’s Snapdragon 835, the other with Intel’s 7th-gen, low-power, Core i5-7Y54. Both are shipping products still being actively sold by HP today. It’s about as apples-to-apples as you can get. And while the results aren’t exactly surprising, they do highlight the clear choices you can make if you buy today—and the challenges Qualcomm faces as it tries to catch up to Intel. The HP Envy X2 comes in Intel or Qualcomm ARM trim with the only discerable difference being the amount of ports (the Intel version has two USB-C while the Qualcomm-one has one USB-C). The Envy x2s we tested are nearly identical. Both versions feature 12-inch, 1920x1280 touchscreens with pen support, as well as Surface-esque keyboard covers (although the Intel version’s cover is horrible.) Both also feature 49-watt-hour batteries and both, of course, run Windows 10. 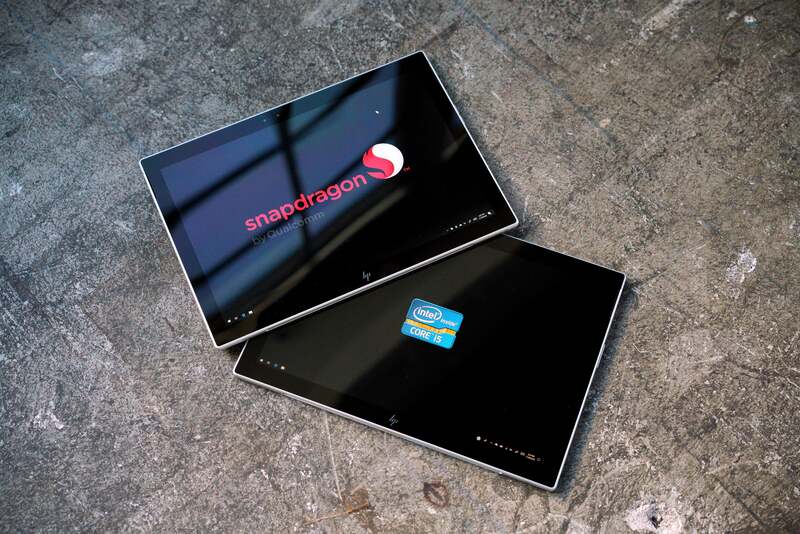 The Intel Core-based tablet came from the factory with 64-bit Windows 10, while the Snapdragon-based tablet came with Windows 10 in S-mode. For this comparison, we used the option to switch the latter tablet to full Windows 10. One last note: Although HP only sells the Envy x2 with 4GB RAM/128GB storage configurations, the Qualcomm-based Envy x2 we borrowed featured 8GB RAM/256GB of UFC storage. So while, it’s not quite even, the advantage here goes to the Qualcomm-based tablet. Our first test is Maxon’s Cinebench R11. This benchmark is older than the popular Cinebench R15, but it runs on the 32-bit only ARM-based Envy X2. It still relies on a real-world engine used in the company’s Cinema4D (albeit much older at this point.) The test is multi-threaded, and the more cores and threads you throw at it, the faster it gets. At first glance, the results for the Snapdragon 835 aren’t great. But if you look on the bright side, the Intel chip is only about 57 percent faster. Because the Snapdragon 835 is an 8-core CPU, and because this test is multi-threaded, it gets a fairly decent boost, even if four of its cores are low-power “little” cores, and only four are more powerful “big” cores. 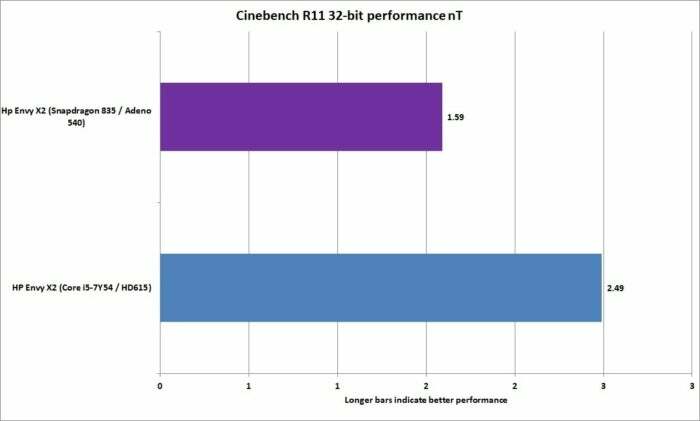 Using Maxon’s older Cinebench R11 in 32-bit mode, the Snapdragon 835 trails the 7th-gen Core i5-7Y54, though by less than we thought. 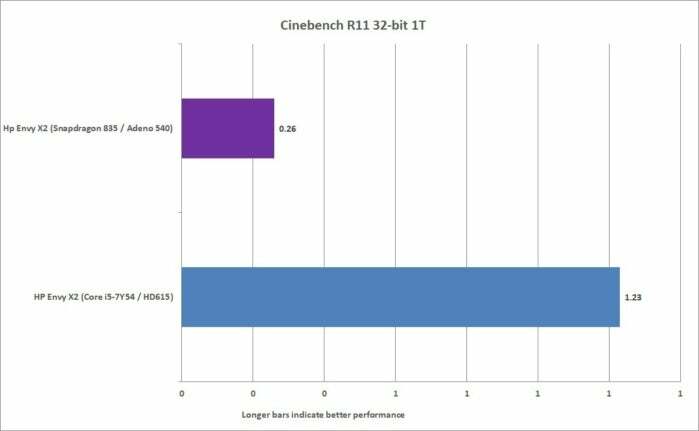 To find out the performance of each individual core, we set Cinebench R11 to run in single-threaded mode. The results are far worse for Snapdragon: The single-core performance of a 5-watt Core i5-7Y54 is about 373 percent faster than the single-core performance of a Kryo CPU inside the Snapdragon 835. The single-core performance of the Kryo 280 CPU in the Snapdragon 835 is pretty terrible compared to the 5-watt Core i5-7Y54. We next ran Tabletmark 2017. This is a cross-platform benchmark made by BAPCo for measuring performance on Windows, Android, and iOS tablets. It uses custom-written applications for each OS, and each OS’s APIs for basic functions such as photo and video sharing, and browsing. The latest version on Windows 10 supports UWP and was rewritten to support the new OS. 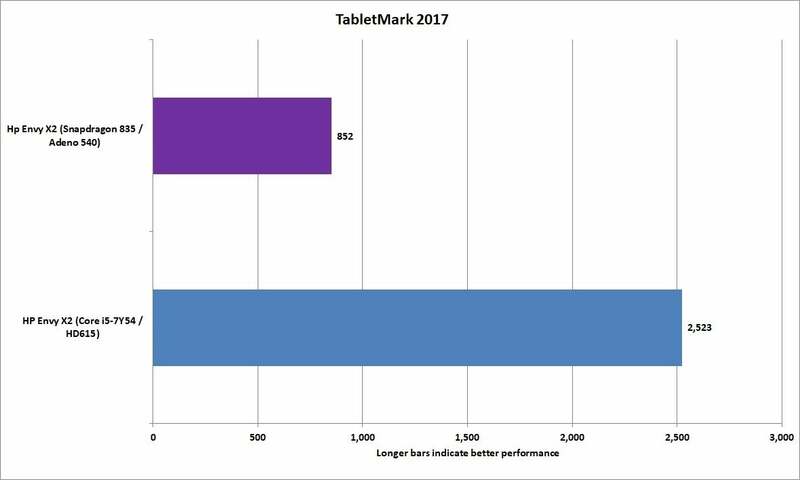 The results are better, but if Tabletmark 2017 is an indication of “business application use,” then the Core i5 is about 200 percent faster than the Snapdragon 835. Tabletmark 2017 measures browsing, and photo and video sharing. The Snapdragon 835 performs about as well as an Atom X5 chip (in other words, not that great). We could show more benchmarks with the Snapdragon 835 likely trailing the Core i5 (sometimes by big margins), but the song remains the same: Running Windows 10 apps, even UWP apps from the Windows store, doesn’t end well for the Snapdragon 835. Instead, let’s try to find out a little more about why the Snapdragon 835 might be so far behind even a mid-range Core i5 low-power chip. For that we turn to the latest version of Geekbench 4. The benchmark lets you measure performance in x86 and also running native ARM code. Remember, Windows has been primarily an x86 operating system; running the OS and applications on ARM is a little like speaking a different language at full speed. To make instructions for x86 work on ARM work, Microsoft and Qualcomm translate the binary instructions in real time. This translation eats performance, and we get a glimpse of how much it costs using Geekbench 4.3.0. The longer purple bar is the performance of the Snapdragon 835 running without translation in its native language. It’s a huge jump in performance for the ARM chip and shows what it could do if it didn’t have to struggle so much with Windows. The second purple bar below is the performance in x86 after it has been translated and executed. There's that performance gap. 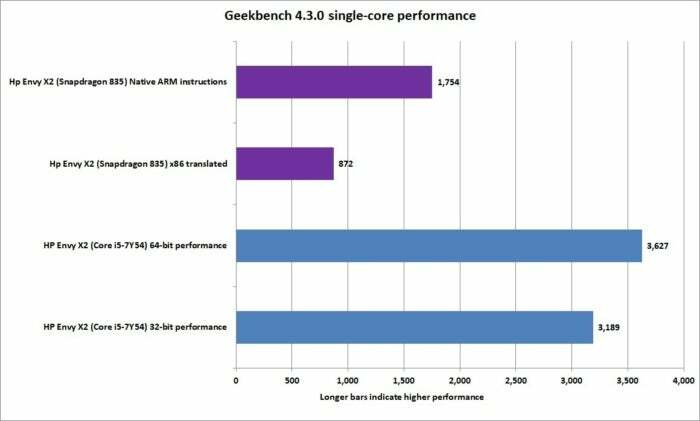 Geekbench lets you test both x86 translated performance and native ARM performance of the ARM chip inside the HP Envy x2. If you believe the Snapdragon is magically made as good as the 7th-gen Core i5 based on the above results—remember that’s the multi-core performance where we’re talking eight cores on the Snapdragon 835 vs. two cores on the Intel Core chip with Hyper-Threading. 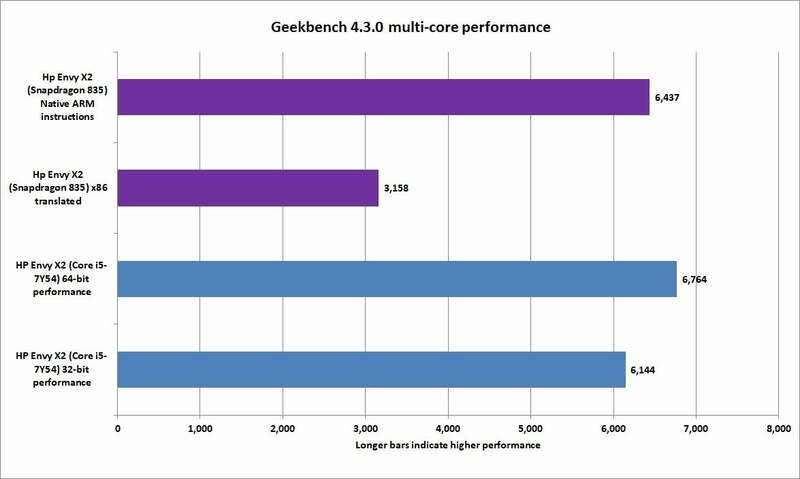 Geekbench’s single-core performance gives you a better idea of how far Qualcomm has to go before it can declare victory or even parity. The shorter purple bar, again, is x86 translated, and it’s performing worse than an Atom X5 in a Surface 3. 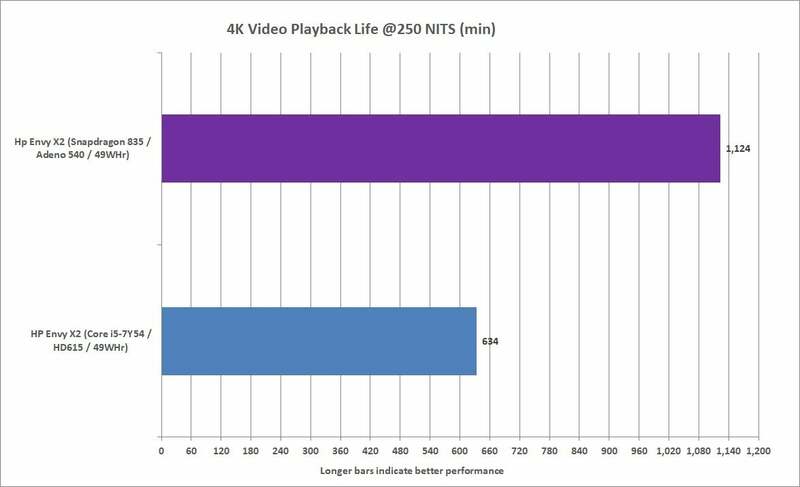 Native performance, is far, far better, though still a behind what you’d see in a Pentium 4415Y in the new Surface Go. The Snapdragon 835’s single-core performance is slower than an Atom X5 in Surface 3 when it has to go through the translator, but running native ARM instructions, it’s actually close to a Pentium 4415Y in the new Surface Go. So far we've focused on the Kryo CPU inside the Snapdragon 835, but there’s also a graphics core. 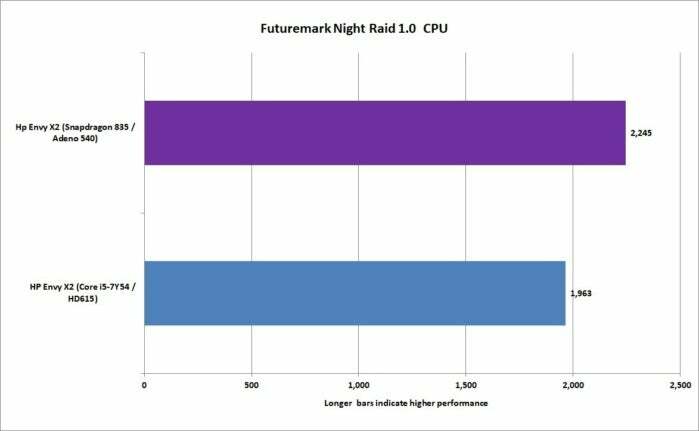 UL’s new Futuremark Night Raid DX12 test supports ARM-based CPUs running Windows 10. That means we should see the best performance from the Snapdragon 835's Adreno 540 GPU, rather than having to deal with real-time binary translations of instructions. The results are what we’ve come to expect. The Intel HD615 in the Core i5 is about 68 percent faster than the Adreno 540 in the Snapdragon 835. Intel's HD615 integrated graphics is about 68 percent faster than the Snapdragon's Adreno 540, even when running native ARM code. Futuremark also measures and breaks out CPU performance when doing game physics. Remember that this result is a multi-threaded test, so it’s not surprising that the Snapdragon 835’s eight cores prevail over the Intel Core chip’s two. The Intel Core i5-7Y54 finds itself at disadvantage when running multi-core, game physics tests. 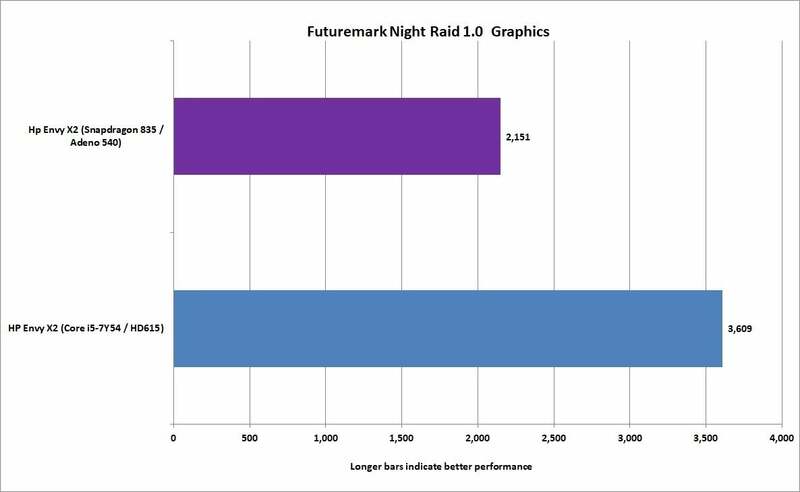 We are, however, talking about 8-core Snapdragon vs. 2-core Intel Core. Our last official test result is the one reason you might want to consider the HP Envy X2 with ARM over Intel—battery life. To measure that, we set both tablets to airplane mode and set the brightness to the same 250 to 260 nits. That’s office-bright—not I’m-trying-to-eke-out-a-day-of-run-time brightness. We then loop a 4K video using Windows Movies & TV while playing audio through an in-ear headset. The results speak for themselves. First, we can’t complain about the Envy x2 with Intel. It’s basically 10 hours of playback. But when you want to go for the gold, the Envy x2 with Qualcomm gives you a stupidly long 16 hours of run time. The Intel-based Envy x2 gives you a great 10 hours of video playback on battery, but the Qualcomm-based Envy x2 gives you a stupid-good 16 hours. The primary conclusion is that the binary translation Microsoft and Qualcomm uses is pretty cool. It lets tablet and laptop users on ARM run their conventional Windows applications. That’s what separates today’s ARM-based tablets from the complete and utter failures that Windows RT tablets were in 2013. That nifty feature though, is also what makes Windows 10 on ARM painfully slow. Using a Windows ARM tablet, you’d swear it was Core-class responsiveness in some applications like Edge, Office or Windows. But hit a non-native application, like Google Chrome or Slack, and the ARM tablet slows to a crawl that would make a snail flash his high-beams at you so it can pass. The choice is clear: The Intel-based Envy x2 (available at HP.com) offers the best combination of performance and battery life. It's the overall winner. But the Snapdragon-based Envy x2's 16 hours of battery life is nothing to sneeze at, assuming your priority is battery life over performance. It also currently costs about $100 less via HP.com than the Windows version. Take this verdict as current rather than final, though. The Snapdragon 835 is a first-generation attempt from Qualcomm. Given the speed at which the company iterates SoCs for tablets and phones, it’s entirely possible ARM will be a viable option for Windows someday. This is just round 1 in what could to be a long fight.